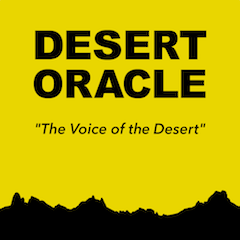 Producing radio series, podcasts and the acclaimed pocket-sized field guide to the mysterious desert. A moody road trip through the mysterious American desert. Weekly series hosted by Ken Layne, 28 minutes. 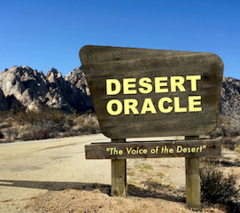 Anna Merlan, author of Republic of Lies, joins us for a weird ride down the Conspiracy Highway, which is our main road out here in the desert. Miley Cyrus climbed up a Joshua tree. For social media, of course. It's a crime to do such a thing in Joshua Tree National Park. “I will never forget it.” That’s something you’ll hear, something you’ll hear quite a lot out here. “I know what I saw.” Do they know? Do you? The superbloom is upon us, as is the superbloom mob. St. Minerva help us all! Parallel dimensions and the mysterious Utah ranch bought by aerospace businessman Robert Bigelow. With guest Jeremy Corbell. What's going on over the desert? Why is everybody going nuts about UFOs again, anyway? Two weird trips to Death Valley: 1849 and 1949. Giants, aliens, underground cities of gold! A harsh visit to the desert of the Bible: a place of banishment and horror, where ostriches and demons dance in the abandoned cabins.